During the week between Christmas and New Year’s, I became friends with the couch again. It had been a while since we’d spent time together, but we caught up and became comfortable pretty quickly. I don’t think I ever got around to napping, but I did read some cookbooks and food magazines and watch some television. As I sat lazily in front of the television one morning, pondering what we should enjoy for food on New Year’s Eve, there was a cooking show on that grabbed my attention. I can’t remember the last time I watched a cooking show and actually wanted to make what the host was making. What I was watching was Alex Guarnaschelli charring broccoli rabe to turn into a chunky pesto with garlic, olive oil, and parmesan. That pesto topped a pizza with cooked mushrooms and sliced, fresh mozzarella, and I liked this idea a lot. Our New Year’s Eve was going to be a simple stay at home affair with fun food like pizza and a couple of other snacks I’ll mention soon, and I immediately decided to steal Alex’s idea for how top our pizzas. The full recipe found on the FoodNetwork site, involves skillet fried pizza dough. I skipped that step, made pizza dough with whole wheat flour, and baked my pizzas on a stone in a very hot oven. For the pesto, I charred the broccoli rabe in a saute pan with crushed red pepper. When it was tender and browned on the edges, it was transferred to a cutting board and chopped. Then, olive oil was drizzled over it, and minced garlic and grated parmesan were added. Next, sliced crimini mushrooms were sauteed in a small amount of oil. The goal with the mushrooms was to cook them until they were dry. I topped the pizza dough with the pesto, then some sliced mushrooms, and a layer of sliced, fresh mozzarella, and baked it for about 12 minutes. When each pizza came out of the oven, more parmesan was grated on top. I’m glad I was lazy and sat around watching tv and learned about this pizza. The mushrooms and cheese and chunky pesto combined deliciously on top of the crispy, whole wheat crust. I probably should have chopped my broccoli rabe a little smaller, and I probably wasn’t quite generous enough with the olive oil in the pesto, but that’s ok because I’ll be making this so often I’ll eventually perfect the process. And, what all this really means is that I should start spending more time sitting on the couch. This looks just delicious! I have a very close relationship with my sofa : )! man that looks great too me!! I will have to try this sometime!! The perfect dish on a cold winter's day... It'll have everyone coming for seconds AND thirds I'm sure! I like the couch prescription a lot - and if it results in this kind of a pizza I am going to work on it! Sounds way more productive than what often comes out of my couch time lately! :) Love the sound of this pesto... bet it would be great on a panini! Wow, I love pizza like however my husband had a fit when I threw brussel sprouts on pizza, which was so good by the way. This looks like an awesome combo. Oh yum, that looks amazing, I was just reading about brick oven pizzas in an older issue of F&W and you've tipped the scales, must get some soon. I just made some roasted mushrooms, but just by themselves with some pasta. This looks like something I could have now rather than my dinner. The pizza looks amazing with mushrooms and the pesto! Wonderful! I have yet to attempt making my own pizza crust so far, but its on my list of things I want to be able to make. Looks delicious. Nice crust, too. That looks delicious! Wonderful combination of flavors! wow!! your pizza + my couch = perfect night. This looks so good! I have been collecting pizza recipes lately, and this is going in the rotation! This looks like it came straight out of a Brixx restaurant! Not even kidding. Looks delicious! I was craving something different in a pizza the other night. This is exactly what I needed! It looks excellent! What a great way to send the year off. I can almost taste the slightly bitter charred rabe with the creamy cheese and earthy mushrooms. Lisa! How amazing does this look?? I absolutely love broccoli rabe on pizza and charring it would just send it over the edge. I haven't made pizza in a while and I know what kind I am making next time! Great combo for a pizza! And a mouth-watering photo too. I have heard several people talking about how much they like Alex Guarnaschelli....I know who she is but have never watched her show. It must be on at a bad time of day for me. I'll check today. Yummm...a great pizza with healthy extras on a "lazy" day or a hectic day. Love it! Wow! Cheers to you the pizza looks beautiful. I love the flavor combination too. This pizza sounds outstanding! The colors and flavors and textures just seem to really work well together. 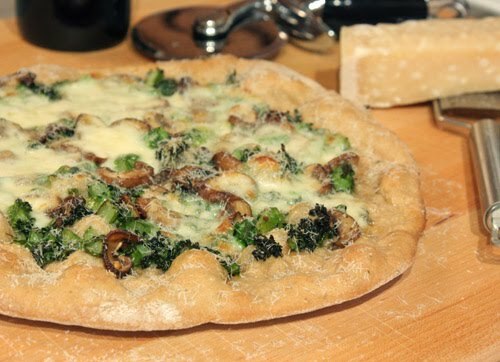 Broccoli rabe on pizza...just sounds so gourmet! I love the toppings on this pizza. And my freezer is full of my homemade pesto. I'm in. Man oh man! This looks so simple & yet so amazing. The crust looks especially tasty! Yum! I've been wanting to make a pesto pizza for a long time and this one sounds wonderful. Lounging on the couch is my favorite weekend activity :) I love this unique and tasty pizza! That pizza looks amazing! 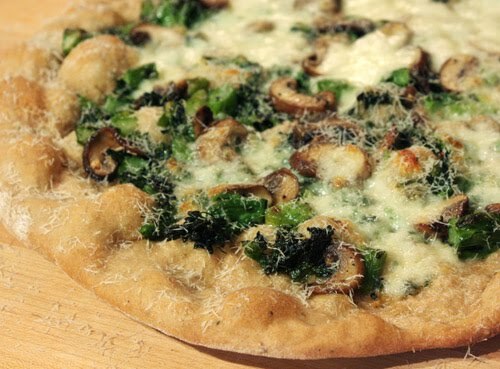 I love a great pesto pizza and with broccoli; it sounds even better. Love mushrooms and it is one of my fav. topping on pizza. unique pesto too.